AAFCANS has proudly been a part of the Australian Defence Family for over 100 years. 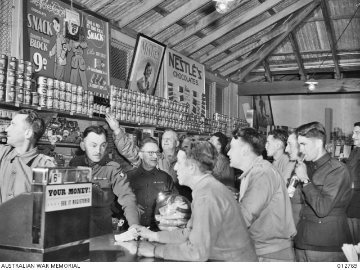 AAFCANS was established in 1915 under the Defence Act 1903, as the Australian Imperial Forces Canteen Services (AIF). The organisation’s name has changed over the course of its rich 100 year history but it purpose remains as strong and as relevant since its inception. The organisation has operated in a support role to Defence providing much needed amenities and convenience products and services for our troops both domestically and overseas and exists solely to help enrich the lifestyle and contribute to the welfare and wellbeing of our ADF Personnel. The canteen service has served alongside our troops through both world wars and on many overseas deployments including Korea, Vietnam and in more recent years East Timor. AAFCANS’ commitment to integrity, transparency and sustainability are equally as strong - you can learn about our corporate governance team and policies by clicking on the appropriate link below.“Uncover our history, and be a part of our future.” you'll also find information about our Mission, Vision & Values Corporate Governance.